They’ve done it again! Michael’s Genuine Food & Drink has been voted Cayman’s favourite restaurant for the third consecutive year at Taste of Cayman. We chalk it up to our staff’s positive energy, teamwork, and of course genuine food, including Pan-Seared Lionfish with local ackee and seasoned pepper vinaigrette, Slow Roasted Local Goat with local calabaza and long bean salad and Warm Doughnuts with local passion fruit curd. Both savory and sweet booths stayed busy all night, only letting up at 10:30, and chef de cuisine Prudent Baselais also took part in a cooking demo of the lionfish dish on the Bon Vivant stage. He also judged the amateur cook off that followed afterwards! Several of our regular guests like Slow Food Leader Alan Markoff said everyone was buzzing about our restaurant the whole night. Taste is one of those events that is a true expression of what’s local to the island, and is its longest running food and wine festival. 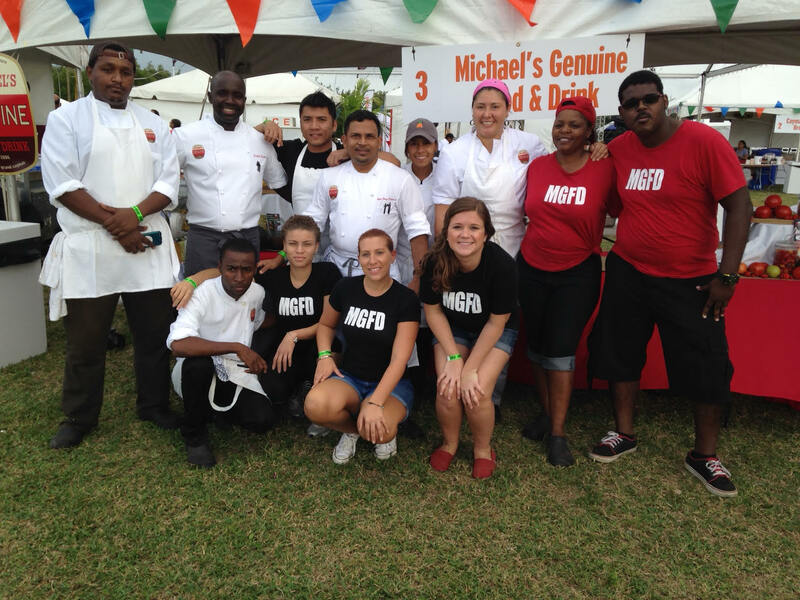 Now hosted in our backyard on Camana Bay’s Festival Green, Taste of Cayman began in the late ’80s with a small number of restaurants from the Cayman Islands Restaurant Association meeting in a field to compete in a Chili Cook Off. The event is now in its 27th year and has now grown to showcase over 45 restaurants and distributors participating in an open air event that attracts thousands of people. Our restaurant will be 5 years old this summer, but having the opportunity to recognize the work of our team in the restaurant never gets old and what better reason to show up than Taste! There are a number of awards handed out throughout the night by secret judges for Best Booth, Best Food, Best Drink and more. The most coveted award of the night however is the Cayman’s Favourite Restaurant award which is the only people’s choice award. Upon entry festival attendees will receive a wooden nickel which they will carry with them until they determine the one restaurant they deem deserving of the title! The winning restaurant, as voted by the festival attendees will hold rights to the title Cayman’s Favourite Restaurant and receive a $1,000 cash prize. So… Drinks on Cayman? Boom! Next up… February’s Clam Bake!